Plant produces high yields of 12" long by 1 ½" wide hot peppers. 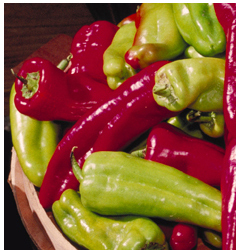 Peppers are mildly hot and turn from dark green to red when mature. Pepper has a thick flesh. Plant has green stems, green leaves, and white flowers. Excellent drying pepper, in salads, salsa, or pickling.